Blepharitis is a common condition where the edges of the eyelids (eyelid margins) become red and swollen (inflamed). In most cases both eyes are affected, but one eye can be more affected than the other. The symptoms tend to be worse in the morning. See your high-street optician (optometrist) if you have persistent symptoms of blepharitis that aren't being controlled by simple eyelid hygiene measures. Contact your optometrist or GP immediately if you have any severe symptoms. If this isn't possible, visit your nearest accident and emergency (A&E) department. Blepharitis is usually a long-term condition. Most people experience repeated episodes, separated by periods without symptoms. It can't usually be cured, but a daily eyelid-cleaning routine can help control the symptoms and prevent permanent scarring of the eyelid margins. Read more about treating blepharitis. Posterior blepharitis is caused by a problem with the Meibomian glands, where the glands get blocked by either debris, skin flakes or inflammation. Sometimes blockages in the Meibomian glands are associated with a skin condition called rosacea. If too much oily substance is being produced, this may be caused by seborrhoeic dermatitis. 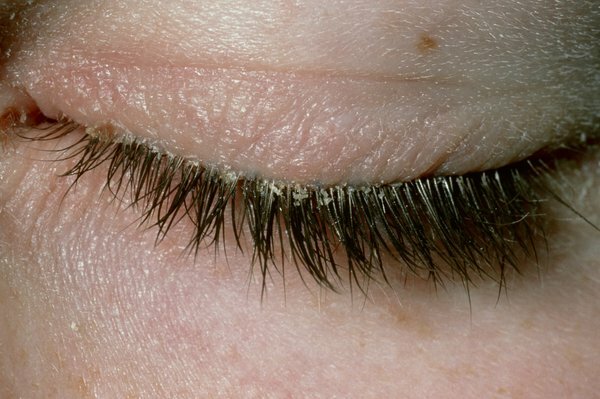 Mixed blepharitis, which is the most common, is caused by a combination of both anterior and posterior blepharitis. Blepharitis isn't usually serious, although it can lead to a number of further problems. For example, many people with blepharitis also develop dry eye syndrome, where the eyes don't produce enough tears or dry out too quickly. This can cause your eyes to feel dry, gritty and sore. Serious, sight-threatening problems are rare, particularly if any complications that develop are identified and treated quickly. Read about the complications of blepharitis.